It was my birthday last week and I turned the lovely age of 28. With only a couple of years of my twenties left I started to think about what I want to achieve before I turn 30. I guess I have done a lot of the things that are on many peoples check lists – got married, bought first house, had a baby, found a job I love, had an article published in a magazine, won a few competitions. I have also done a few crazy things in my twenties – done a fire walk, a zip slide, dressed as a sunflower and a pumpkin in public. The things I haven’t really done involve travelling lots of places, as I’m not really a traveler and starting a family has been my financial priority. 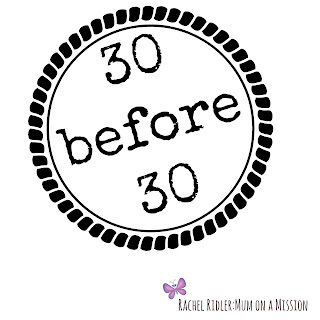 If you have any suggestions for things I can add to bring this up to 30 then please do share them below!!! Ive got a 50 before 50 list, and one of the things on my list is to grow a bonsai tree for each child and plant a tree for the Grand Babies. Oh and get a Glamour portrait done with my daughters, and throw myself an awesome 50 th birthday party. I am happy to assist with many of these – esp number 3!! I would suggest : watch a movie outdoors, play pinata, host a murder mystery dinner party, create a work of art, and explore a forest!